It’s official. I’m a Pahlish junkie. After you see these swatches, if you aren't a Pahlish junkie already, you might become one too. Greetings fellow nail nerds! 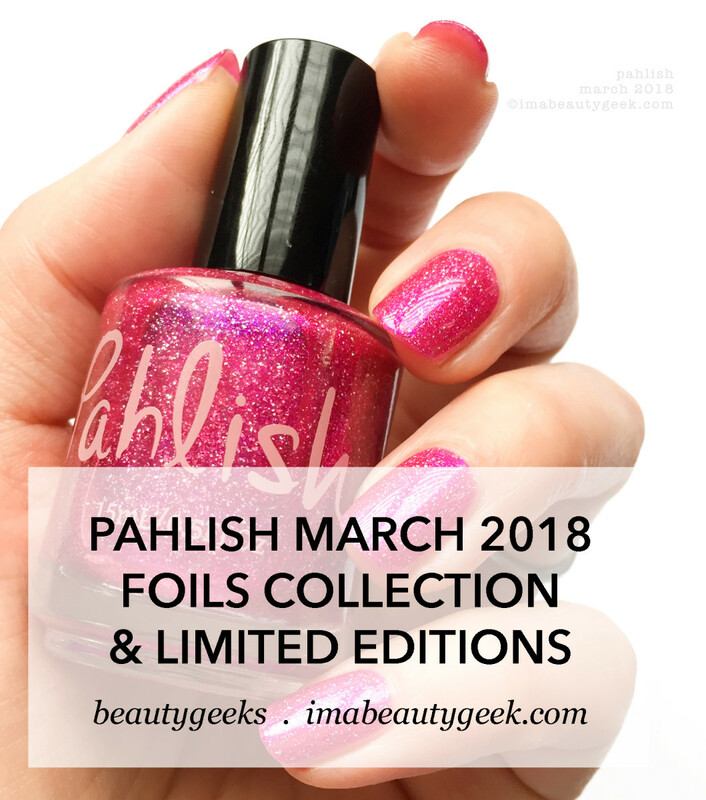 March 2018 marks the 6th anniversary of Pahish and right here, right now, I have the Pahlish March 2018 collection AND the Pahlish March limited edition shades to show you! It’s kind of exciting! First, the March collection. Second, the special Pahlish March limited editions! 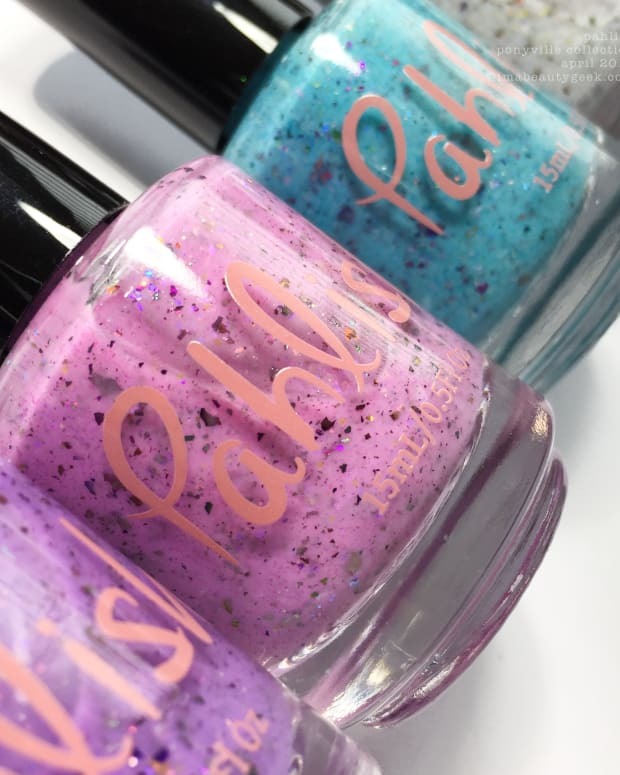 Pahlish Dust Bunny – March 2018 Collection (above). Okay, it’s mostly a collection of fabulous foil flora but first, there’s Dust Bunny. She’s a beautiful, lightly speckled soft white that is wickedly charming. I don’t quite know what it is about this shade but I think I love her. In 3 thin coats, she looks waaaay more appealing than the dust bunnies that roam around under mah desk! 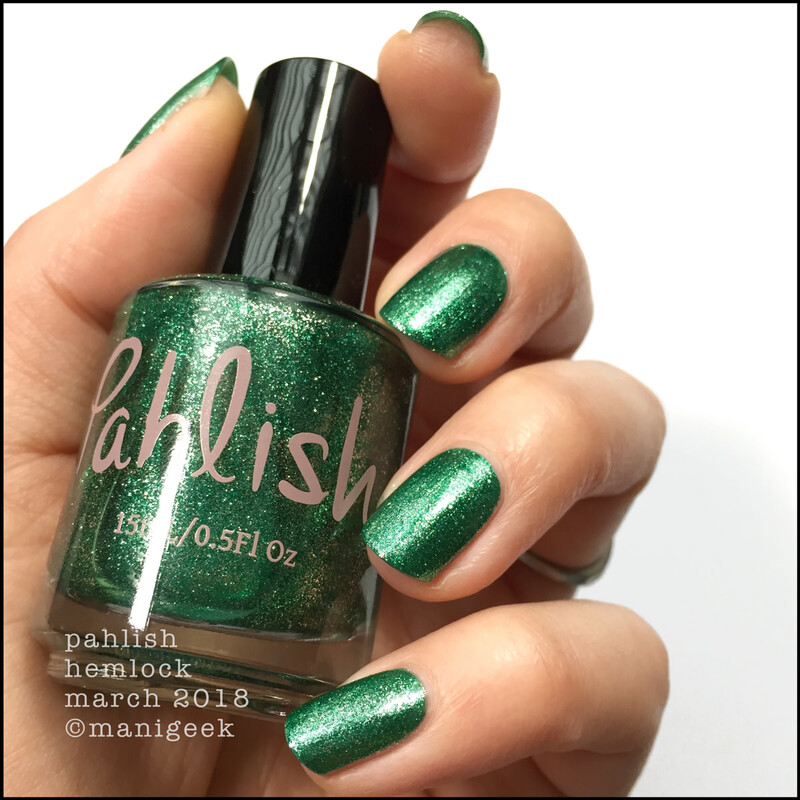 Pahlish English Ivy – March 2018 Collection (above). Unnnnh. Lookit that bright, shimmery golden green! That’s 3 thin coats plus my Revlon QDTC. 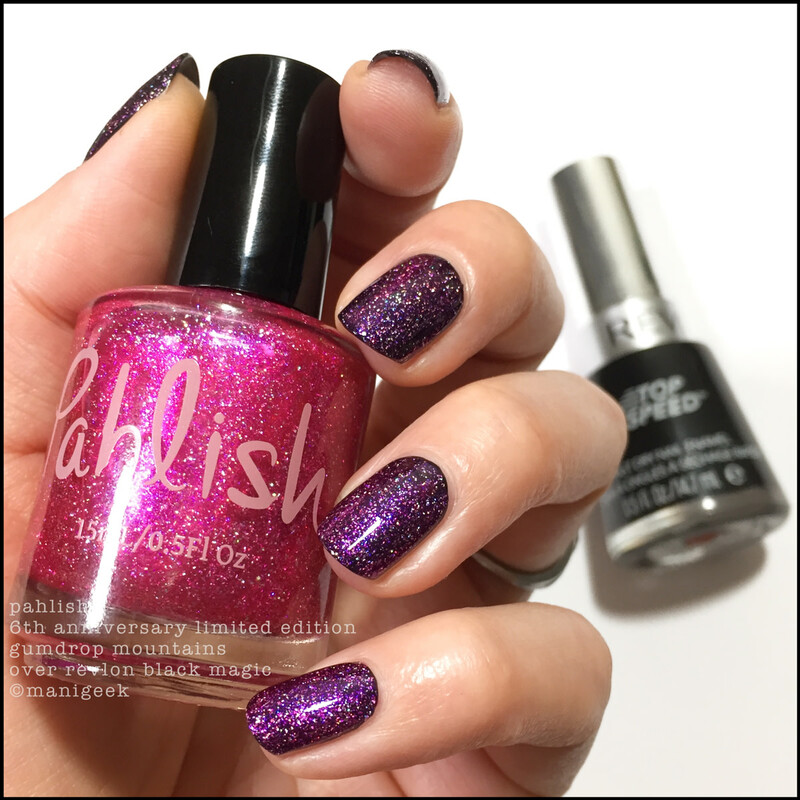 Pahlish Hellebore – March 2018 Collection (above). We should just look at this and not talk. You know, like we’re at an art museum or sumthin’. Just let it wash over you and be in the moment with it. You wannit. I know you do. Oh – 2 coats with no top. Pahlish French Lavender – March 2018 Collection (above). This was the first one I swatched (because lightest to darkest is mah rule) and I swooned. I have huge heart-eyes for all things foily and now I have huge #GrabbyHands to go along with my heart-eyes. Shannon is just a Pahlish-making rock star. Pahlish French Lavender – mixed lighting (above). And here she is again with natural light plus a huge hit of artificial light from my crummy Ikea desk lamp. I dunno if you can tell, but artificial light somehow adds a level of saturation. Weird, right? I figured a light bulb would make it brighter but mostly, it seems to pick up the base colour and add sparkle instead. All the ways, in any kind of light, #GimmeThat. 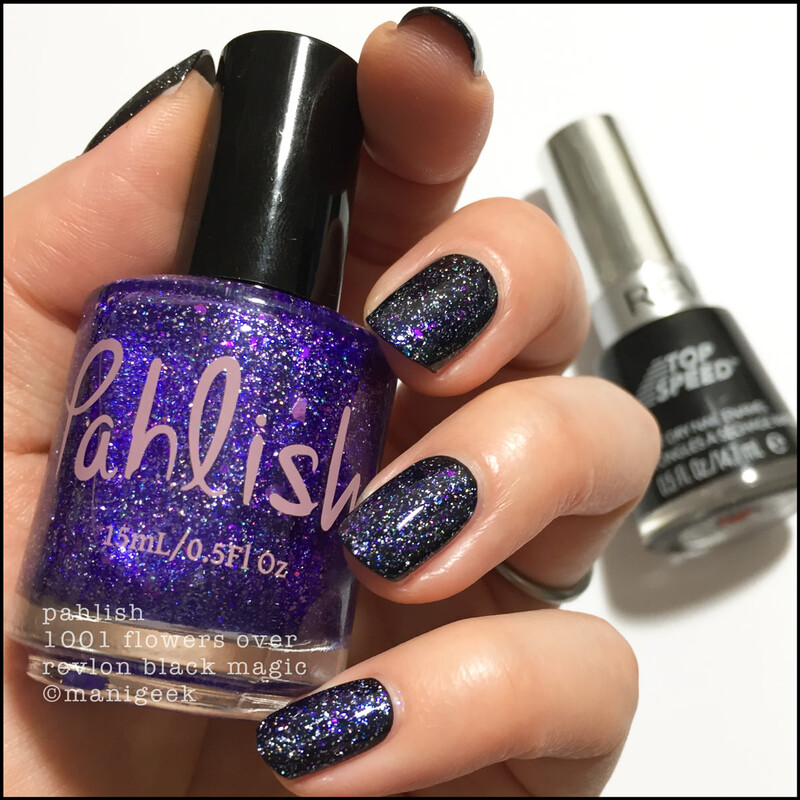 Pahlish Ashwood – March 2018 Collection (above). How’s that for a beauty, huh? She’s got a softer kind of foil finish that I just couldn’t bring myself to top coat. Instead, I just want to touch it – it looks so satiny smooth and shimmery and warm. It’s a marvel in 2 quick coats. 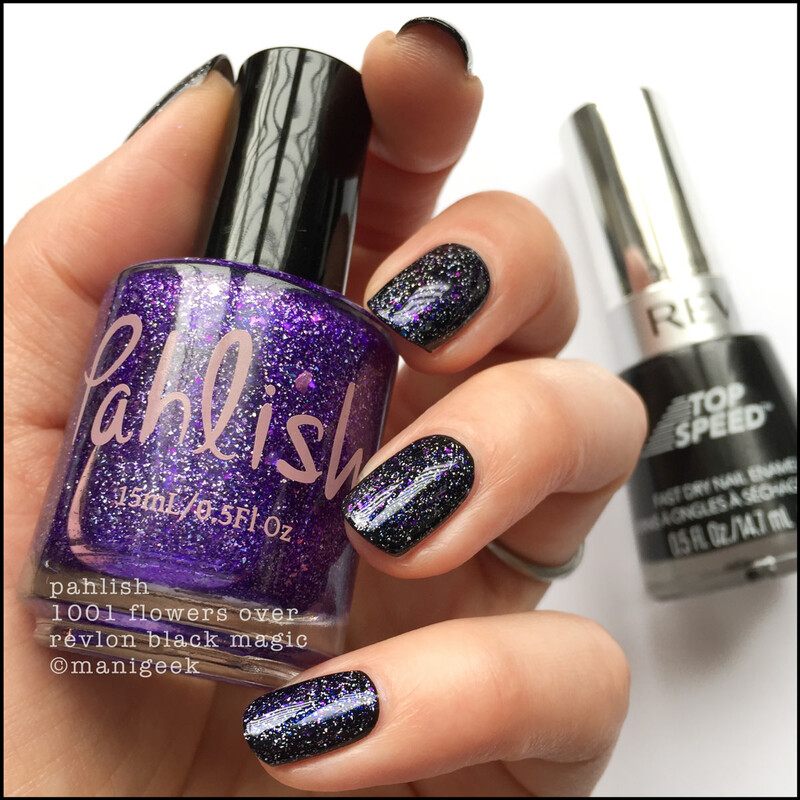 Pahlish Black Forest – March 2018 Foils Collection (above). This one had a thicker formula than most of the others and desperately needs top coat. Without top, you won’t get that deep kind of under-glimmery saturation. Man, I wish I’d had this over the holidays – I’d have worn the crap out of it! Pahlish Honeysuckle – March 2018 Collection (above). Is it pink? Is it orange? I dunno! All I know is that it’s bold, bright, shimmery, and puts a big ole smile on mah face! 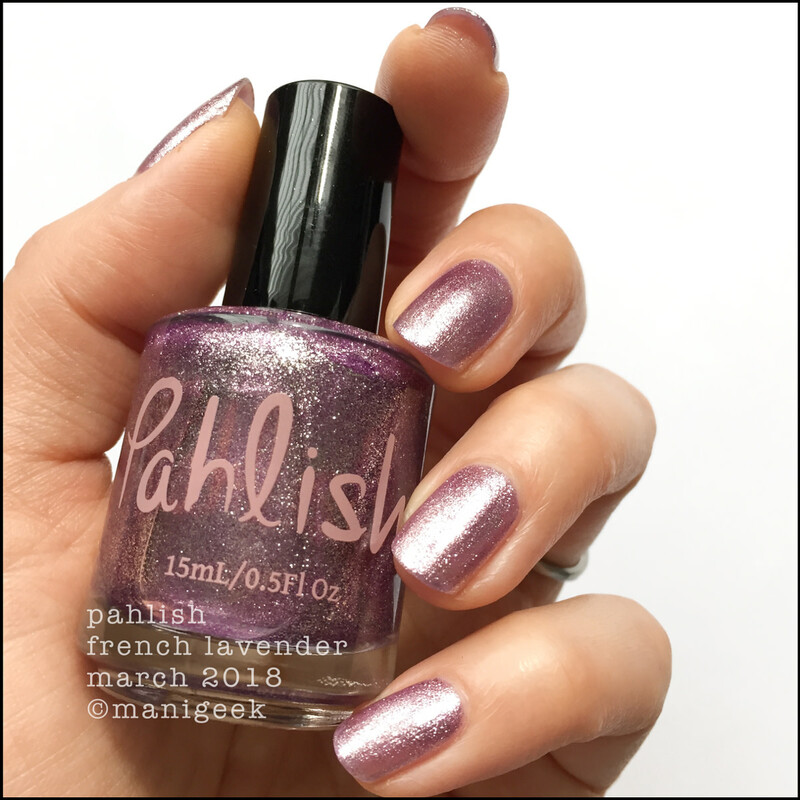 Pahlish Hemlock – March 2018 Collection (above). I used to have a favourite green that was the perfect green for St Patrick’s Day. Now I have a new favourite green that’s the perfect green for St Patrick’s Day. Move over old favourite green, Pahlish is in da house!! Pahlish Bluebonnet – March 2018 (above). That’s 2 coats + top to this inky almost-navy foil. If you’re me, without top coat, Bluebonnet will remind you of OPI Ink Suede. With top or without, I’m forced to repeat myself and be all Gimme.Gimme.Gimmeeeeee. Pahlish Gumdrop Mountains – 6th Anniversary Shade (above). Nothing makes me happier than a hot pink polish except maybe a hot pink Pahlish. This is Gumdrop Mountains (b/c traditionally, candy is whatcha give for the 6 anniversary) and here, in natural light, she gives me the superb gift of bluey-purple flashies that I just can’t ever seem to resist. Pahlish 6th Anninversary Limited Edition - Gumdrop Mountains (above). With a smack from my desk lamp, holo flakies & neon-ness come out to play! Oh! I should probably mention that Gumdrop is sorta like a sheer gummy candy polish that builds really easily to opaque. I think that’s 3 thin coats + top but I forgot to take notes because I was too busy falling in love with Shannon. You hear that, Shannon? I falled right into the loves with you! Pahlish Gumdrop Mountains over Revlon Black Magic (above). Oh yes, Manigeek did that. Why? You know why – because she can! Oh – that’s 1 coat over top of mah black, and that’s 100% natural light. Pahlish Gumdrop Mountains over Revlon Black Magic + Ikea lamp (above). See? Scattered holo flakie bits! Yay! Happy 6th Anniversary, Pahlish! Pahlish 1001 Flowers – Pahlish Lovers 1k! Exclusive Shade (above). And finally, after a most enjoyable Pahlish-swatchin’ marathon, I bring you this beautiful flakie-stuffed Pahlish Lovers Exclusive shimmerfection. That’s 2 quick coats followed by wait-a-minute + another coat (so you don’t drag up the 1st 2 coats) + top coat. To me, she shows best in natural light where the bits and pieces all come together to create a complex-but-soft-looking shade of smashingly soothing violet. Pahlish 1001 Flowers – March 2018 Exclusive (above). And shot with my lamp on, she’s all kinds of flecky holo royal purple. Kinda cool what a light bulb can do, huh? Pahlish 1001 Flowers – March Pahlish Lovers Exclusive (above). Oh. Did I mention she’s also a jelly thingy that you can layer over dark stuffs? Yep. You can. Pahlish 1001 Flowers over Revlon Black Magic – artificial light (above). Mmhmm. Same 1 coat over 1 coat + top coat, but with my lamp on. Sadly, that’s it. I wish there were more because I can’t rave about these 11 shades enough, I really can’t. Just know that I love every single one of them and hope that you have tonnes of disposable income this month so you can get ‘em when they launch at Pahlish.com this Sunday March 4 – that&apos;s today! – @ 7pm Central time. Shannon says everything will be available for preorder for a solid week, with regular restock after that. She also says the 2 limited edition shades (Gumdrop Mountains & 1001 Flowers) will remain on preorder until they’re discontinued at the end of March. Girly Bits Cosmetics is gonna carry the Pahlish March 2018 Collection so if you&apos;re in Canada, hang tight & you&apos;ll save on shipping. Girly Bits won&apos;t have the 2 limited shades though so keep that in mind. If you’re reading this, are interested in 1001 Flowers, and aren’t yet a member of the Pahlish Lovers FB group, you won’t be able to get you a 1001 Flowers. Do yourself a favour and join, man. It’s nice there – everyone shares a love of Pahlish and there are swaps, trades, sneak peeks, and generally just a whole bunch of appreciation for Shannon and what she creates. I’m out! I gotta go get some cheeeeese for all the nail nerds who are dropping by here later! See ya’ll soon!